Peaceful, quiet get away in the Green Mountains 14.19 miles from Jay Peak Resort. Private two bedroom log, hunting cabin with open kitchen/living area that offers a relaxing and unique retreat. Owner built cabin with on site materials in 1989, using knotted Pine for the ceiling and walls. Structural beams of Spruce and Hemlock run along high cathedral ceilings. Beautiful stream runs through property! 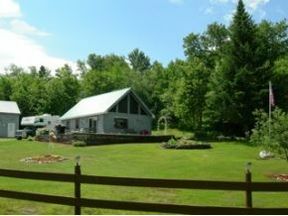 Great location for entertaining the hunting enthusiast, ski/snowmobile and cross country ski enthusiast! Perfect for summertime barbecue gatherings enjoying the hot summer sun jumping in a spring fed, one acre pond with dock! Detached garage (2 level 24x36) with full second floor storage possible use as a studio or guest room. Workshop area on first floor with back up generator off of back in a covered, protected space. Very special and unique piece of property! A must see!